Key OTC pharma innovation trends shaping the industry. 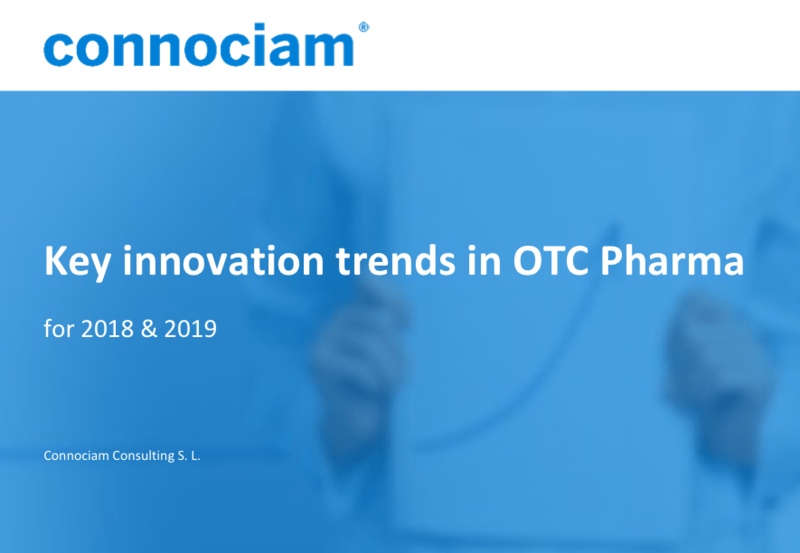 This scouting report shares Connociam’s insights and point of view on the main OTC pharma innovation trends. We have analyzed innovation drivers related to treatments, format, lifestyle and extended offering, and their prevalence across main OTC pharma categories. In this report you will find interesting examples illustrating most of the relevant OTC pharma innovation trends in four key main categories: Analgesics, Cold & Allergy, Gastrointestinal, and Vitamins, minerals & supplements. 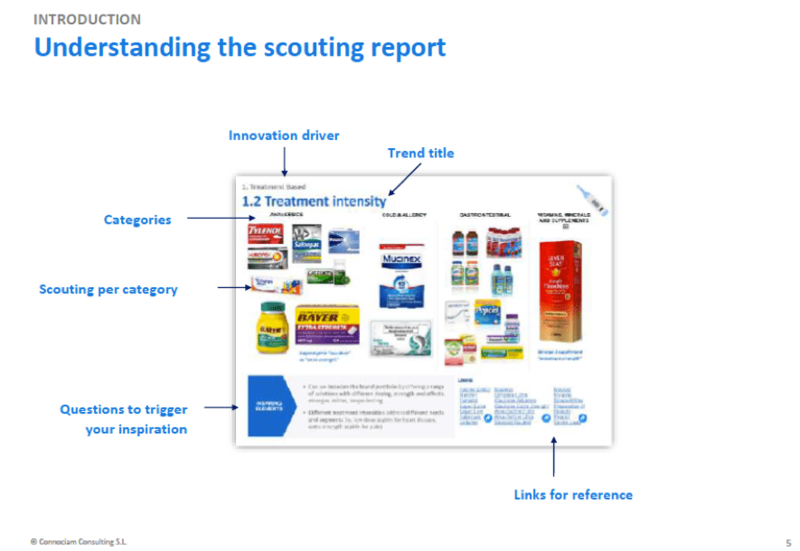 Each scouting page detailing OTC pharma innovation trends is easy to follow and shows clear examples, as you can see below, featuring the most relevant and inspiring cases. Links to direct references and questions to trigger your inspiration are also included. 19 OTC pharma innovation trends are described. These are grouped into four areas: treatment based, format based, lifestyle based and extended offering. The document was designed to be used as a working paper and can be circulated around allowing teams to use examples to trigger their inspiration and to foster innovation initiatives. More specifically, the information contained on the OTC Pharma innovation trends serves as a very good basis for internal inspiration and will help to keep teams updated on the OTC world. Furthermore, it can also be used in ideation exercises on products and services, brand and communication and even new business models. It also constitutes a valuable input in co-creation sessions. In general, we can say, the challenge that has arisen due to the appearance of new players from the food supplement and medical devices categories, is forcing OTC companies to seek out increasingly relevant developments and build stronger brand propositions. Connociam helps clients to develop actionable strategy projects in sales, marketing and innovation. This report includes innovations from brands such as 4head, Advil, Aleve, Aktren, Alka-Seltzer, Allegra, Bayer Aspirin, Beano, Benadryl, Bene-fiber, Buscopan, Calpol, Caltrate, Centrum, Citracal, Contac, Covonia, Deep Heat, Dolormin, Dramamine, Dulcolax, Emergen-C, Excedrin, Ex-lax, Gaviscon, Hydrasense, Ice Gel, Iberogast, Imodium, Lactaid, Laxettes, Lemsip, Lolleez, Meta-Mucil, Mira-lax, Movicol, Mucinex, Mylanta, Nexium, Nurofen, NyQuil, One-a-day, Panadol, Pepcid, Pepto-Bismol, Preparation H, Redoxon, Rennie, Rolaids, RubaX, Salonpas, Senocalm, Senokot, Seven Seas, Strepsils, Sinex, Supradyn, Theraflu, ThermaCare, Tylenol, Tums, Vaporub, Voltaflex, Voltaren, Zantac and Zyrtec. Connociam Consulting S. L. would like to contact you regarding our publications, newsletters, events, publicity and general information by mail. In accordance with the provisions of the current legislation on Personal Data Protection, we hereby inform you that your data will be incorporated into the processing system owned by CONNOCIAM CONSULTING SL , with Tax ID number B65325243and its registered office at CL VIA AUGUSTA 118 PISO 5 PTA 2 08006, BARCELONA, in order to meet your inquiries and send commercial communications that may be of interest to you. In keeping with applicable regulations, CONNOCIAM CONSULTING SL informs users that their information will be kept during the necessary period in order to fulfil the aforementioned conditions. I have read and accept to receive publications, newsletters, events, publicity and general information of CONNOCIAM CONSULTING SL by email.